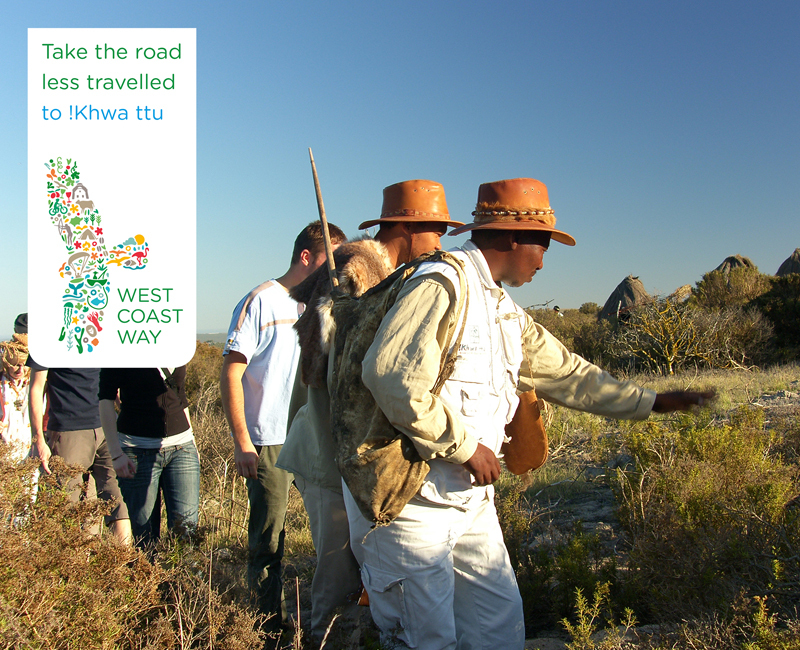 Location: Evita se Perron in Darling is located on the ‘Culture Route’ on the West Coast Way. 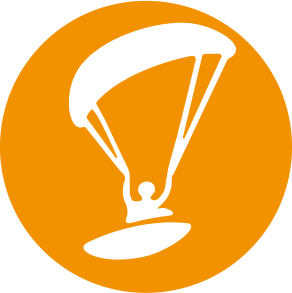 Description: Join us for a month packed with lots of entertainment, food, music and great company. 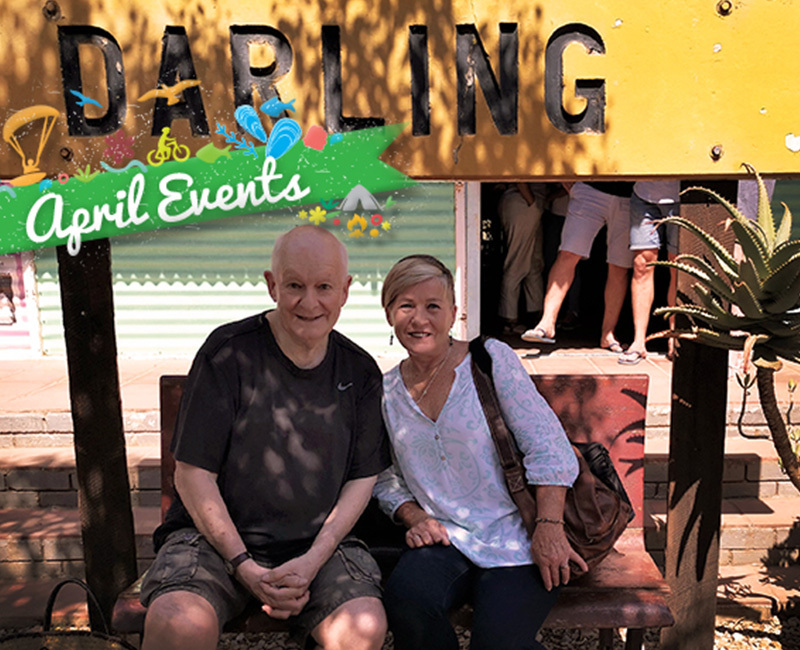 The name Evita se Perron was inspired by the venue’s location in the former Darling railway station. 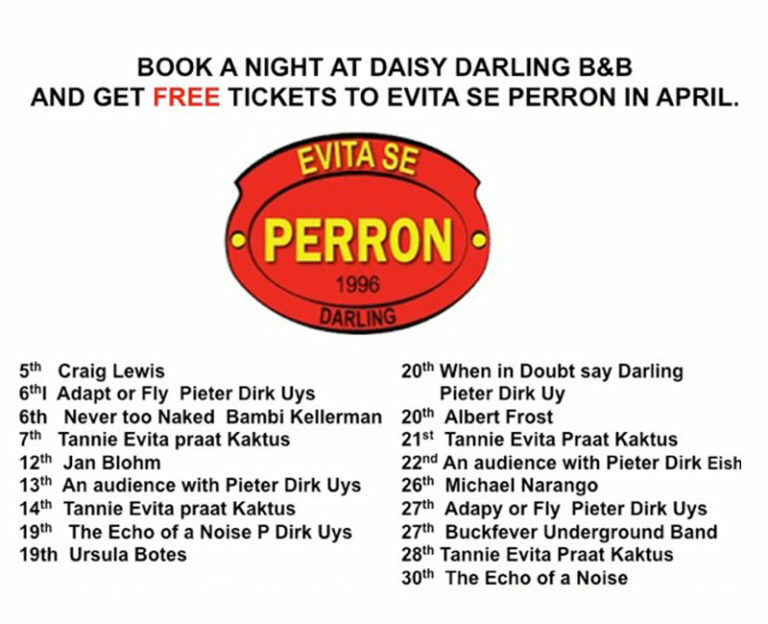 Perron in Afrikaans means station platform and Evita is also the name of South Africa’s most famous white woman, Mrs Evita Bezuidenhout. For all events details click here: http://evita.co.za/. 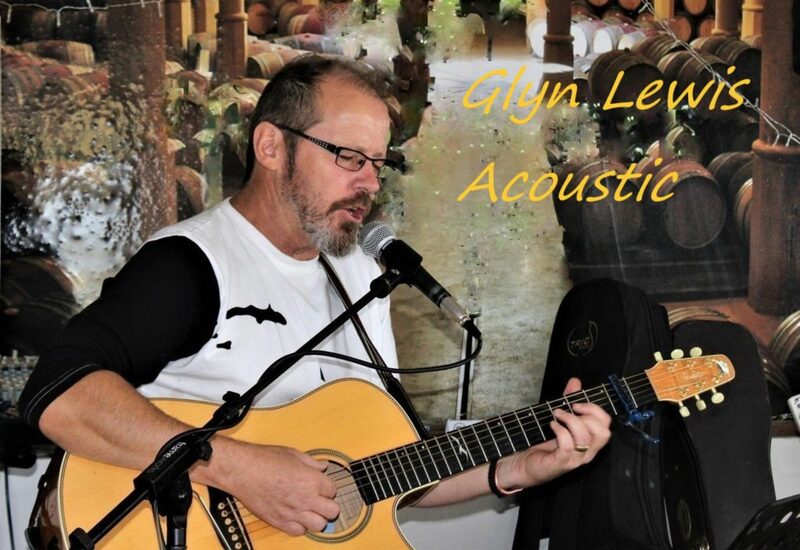 Description: Glyn is a West Coast local from Darling and plays and sings solo, live ”unplugged” acoustic versions of over 300 of the best ballads and songs from yesteryear. Location: Thali Thali is next to Langebaan on the ‘Foodie and Scenic Routes’ on the West Coast Way. 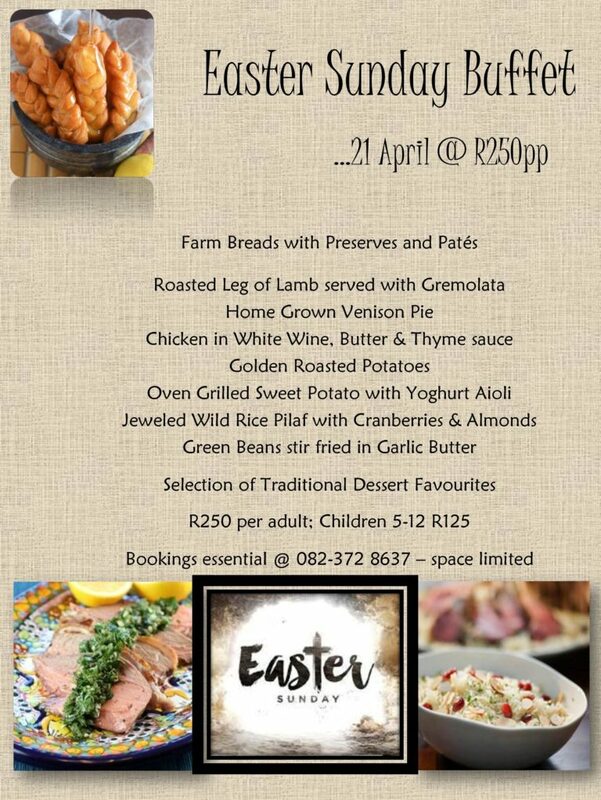 Description: Easter Sunday is a big celebration for us at Thali Thali. Remember to reserve a table for this important day. Take time out and relax at Thali Thali offering a laid-back West Coast style break-away. The stunning restaurant boasts a cosy interior dining and bar area and a large deck from which the sunsets are spectacular. Situated right next to a lapa, splash pool and kiddies play area, it is especially popular on Sundays when they host a sumptuous buffet. 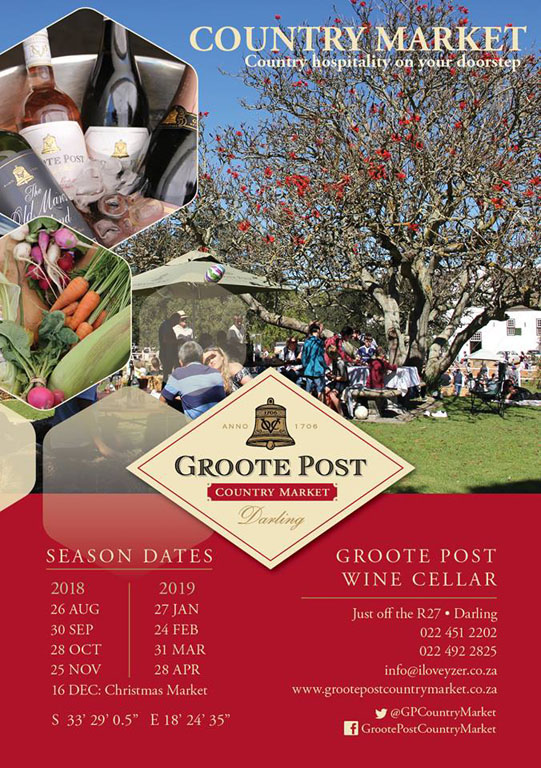 Description: Country offerings include artisan foods, arts and crafts, homeware, clothing, jewellery, accessories, toys, fresh produce and a Bubbly stall by Groote Post Vineyards. Keep the kids entertained with tractor rides, guided horse rides and don’t miss the performance by the Jimm Harisson Project. 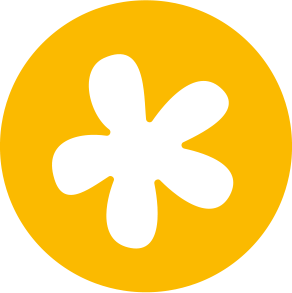 Don’t forget to like the Groote Post Country Market Facebook page for more information. 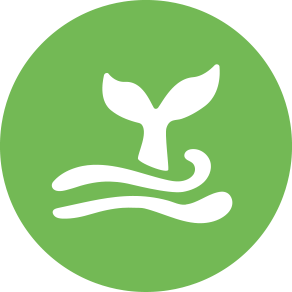 Location: Club Mykonos in Langebaan is your little piece of Greece located on the ‘Foodie and Scenic Routes’ on the West Coast Way. 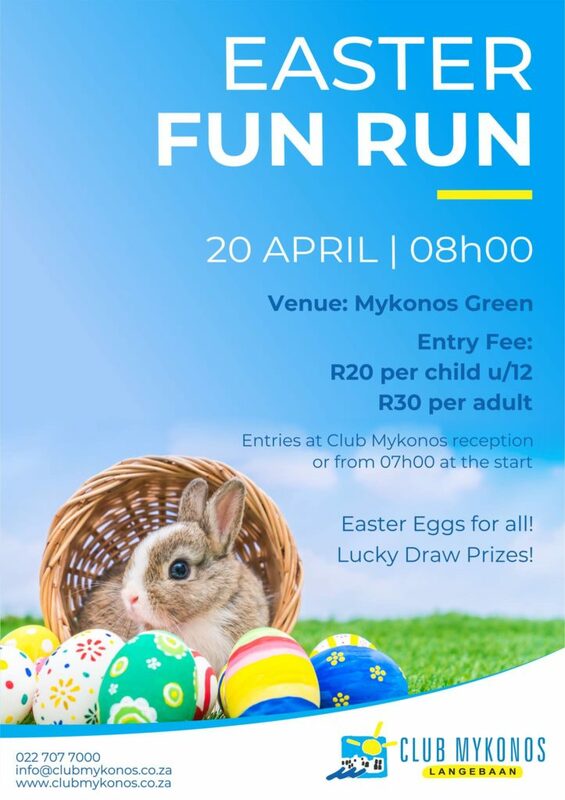 Description: Join us for a 3.8 km fun run at Club Mykonos. 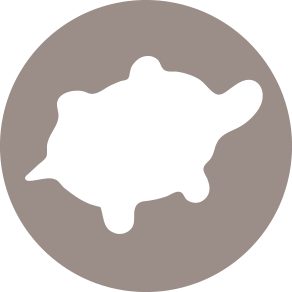 There will be lucky draws. The Marina Village offers 25 units of which there are 2 x 2bedroom units are available for rental. Each unit offers a private balcony, braai area, fully equipped kitchen, dining area, living area, two bedrooms each with en-suite bathrooms and stunning views over the Club Mykonos Marina. Description: Enjoy a delightful outing with the family at the Mykonos Easter Market. Arts and Crafts, Food stalls, Cheese and Wine, Craft Beer, West Coast Coffee, Live Music and lots of fun activities for kids! The Marina Village offers 25 units of which there are 2 x 2bedroom units are available for rental. Each unit offers a private balcony, braai area, fully equipped kitchen, dining area, living area, two bedrooms each with en-suite bathrooms and stunning views over the Club Mykonos Marina. 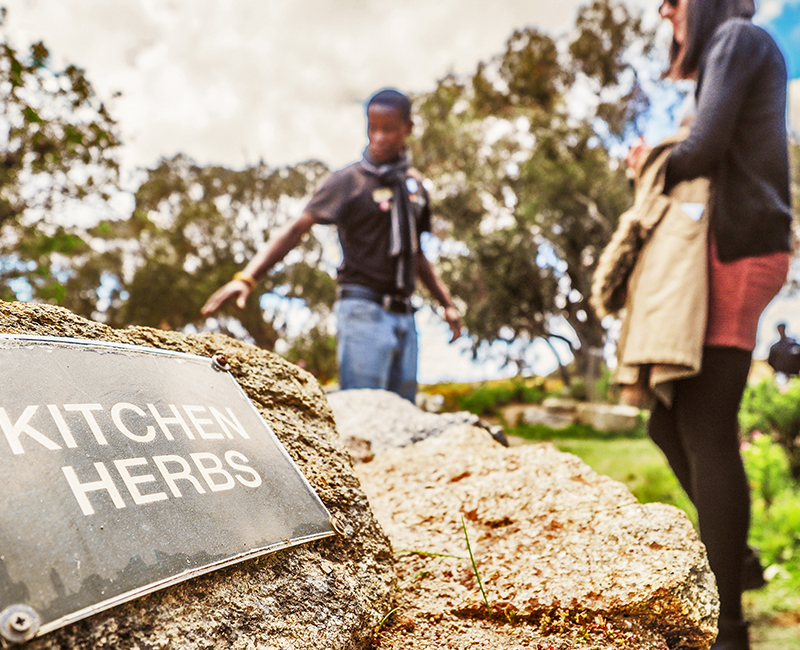 Location: Piekenierskloof Mountain Resort is the gateway to the Cederberg and is located on the ‘Berg and Wild Routes’ on the West Coast Way. Description: Perched at the top of the pass, overlooking the charming town of Citrusdal, Piekenierskloof delivers uninterrupted views of the spectacular Cederberg and genuine country hospitality. 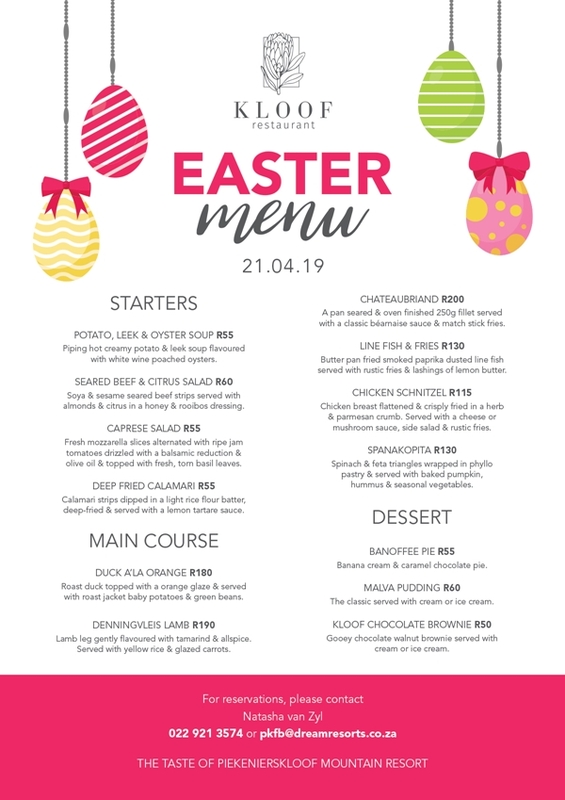 Join us this Easter at the Kloof Restaurant for Easter Lunch. 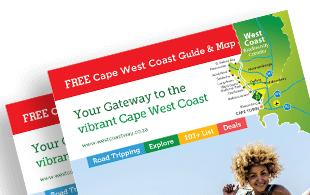 Description: Darling West Coast is the perfect weekend getaway destination, offering myriad activities, both in the town and surrounds. 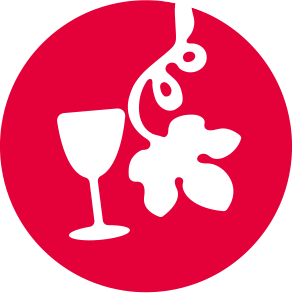 Take in the show at Evita se Perron, sample fine wines and olive products and explore the charming shops and cafes. 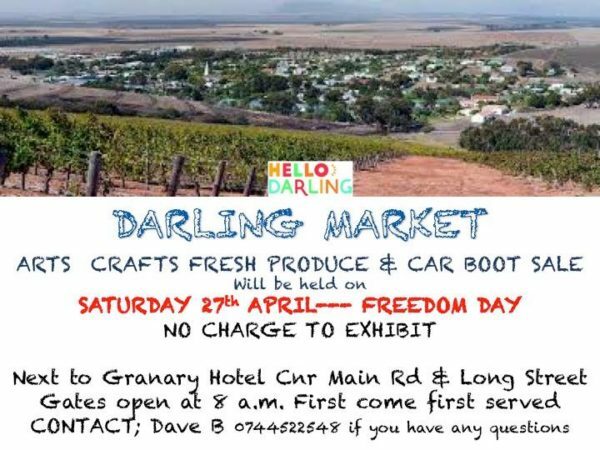 Join us for the Arts Crafts, Fresh produce and Car Boot Sale.